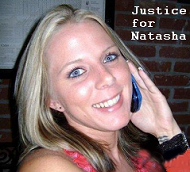 After a grand jury decided to not indict the officers in the shooting of a man at a Beavercreek, Ohio Walmart. Authorities have released the video of the moments leading up to John Crawford III's death. The content is graphic. Because the video released by authorities is in an accelerated speed mode, I slowed it down by half and took stills of the final moments, which can be seen below. It is obvious Crawford went back toward the officers in an apparent effort to retrieve his gun. 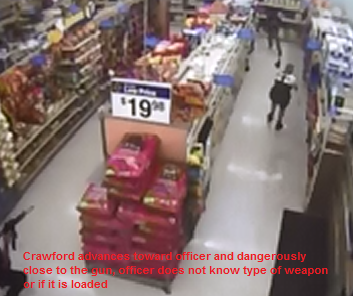 I asked myself why he would do that if the gun was not loaded, however, the Walmart video (short clip here), shows Crawford go straight to the gun and pick it up...maybe he knew the gun was on the shelf, and not in a package, when he picked it up. Maybe he had somehow obtained ammo for the gun at some point prior to retrieving it from that shelf. Just a guess.